Marjan Television Network, typical of this new breed of broadcasters, has just completed a major new refurbishment of its four-studio complex in Wimbledon, South West London. 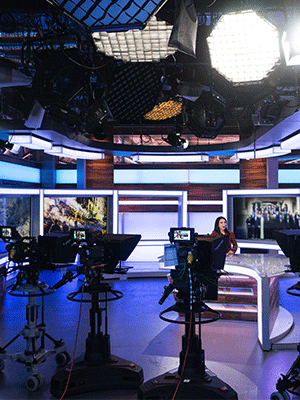 The custom refurbishment uses state of the art equipment and lighting, with extensive use of Chroma-Q®, Spotlight, ProLights, and Quasar Science fixtures. It has been designed so that all the studios can be controlled from a single gallery. The company, one of the leading broadcasters to the Persian-speaking world, transmits to 25 million viewers across the globe. It now employs over 150 staff and produces 2-3 hours of live output every day, as well as pre-recorded content. The channel broadcasts a wide range of entertainment programmes, including Persian-language versions of well-known British favourites such as The X Factor, Come Dine With Me and Spitting Image. Marjans design brief for the new studio complex was multifaceted from both a technical and aesthetic perspective. The facility needed to be flexible to accommodate the wide range of productions, whilst maintaining a contemporary feel. Inherent within this was the requirement for the installation to be energy-efficient with, at its core, a lighting package which was multi-purpose and delivered good colour rendition on camera. After much consideration, Marjan selected 22 Chroma-Q® Space Force¢ soft light fixtures, over 100 Spotlight Fresnels, and Quasar Science Q-LED linear lamps to provide a range of tuneable white LED luminaires for studio lighting. ProLights colour changing LED effects lighting were used for more dynamic productions. These included LumiPix linear battens and a range of moving heads including Ruby beam lights, Stark400 pixel-mappable wash lights, and StarkBlade8 moving battens. Space Force, one of Chroma-Qs flagship products, is ideal for studio lighting, having an output of up to 26,700 lumens with controlled colour temperature from 2,800K to 6,500K. Despite weighing in at only 8kg, it has an internal ballast and passive cooling (no fans), which renders it very quiet in use. Like other Chroma-Q fixtures, it has variable PWM which gives it flicker-free operation, and it can be wirelessly controlled. In addition, 12 Chroma-Q Color One 100X¢ RGBA LED PARs were supplied. All fixtures were supplied by A.C. Entertainment Technologies Ltd. (AC-ET). The company's in-house Tourflex® Cabling custom cable assembly service manufactured to custom order lengths and connector choices, nearly 900 metres of various power, lighting data, and hybrid power/data cabling. This included over 500m of various lengths of Tourflex® Datasafe Ultra¢ lighting data signal cabling; over 250m of various lengths of power cabling, custom assembled with Tourmate® and Neutrik powerCON connectors; and nearly 100m of Powercon and Socapex extension cabling. Other associated equipment supplied included aluminium truss, TV spigots and black safety wire. Ian Muir, who heads up AC-ETs Film & TV division, said: Marjan are a great example of the new breed of broadcaster, at the forefront of using new technology to reach widely dispersed audiences. Being located in London provides them easy access, not just to the equipment, technology and technical skills, but also to the creative designers and production skills that are so essential to make high quality programmes. Jean Luc Neale, Lighting & Vision Engineer for Marjan commented: We have high production values and make a wide range of programmes, which are broadcast to audiences all over the world from these four studios. Because content ranges from news and interviews to dynamic entertainment shows, its really important that the new lighting rigs are flexible, easy to set up and control, whilst also being reliable, low maintenance and with low operating costs. AC-ET presented a wide choice of options and an integrated solution that didnt just include the lighting fixtures themselves, but the accessories, cabling, clamps and support that we needed.